The latest Rain Coat from Hurtta to replace the very popular Torrent Coat. This coat is a thinner version of the very popular Extreme Warmer. It has the same great fit, soft outer fabric that doesn't make any noise when the dog moves, but is elastic and moves with the dogs which makes it comfortable to wear. The high collar protects the dog from rain and wind and the built in rain trap is adjustable and comfortable even though it fits snugly to prevent rain from running in under the collar. A large chest flap, that is very adjustable, protects the dogs chest area from dirt, slush and wet conditions, as well as keeping the body heat from escaping. The clever button under the dogs tail creates a hugging fit that stays in place no matter what. 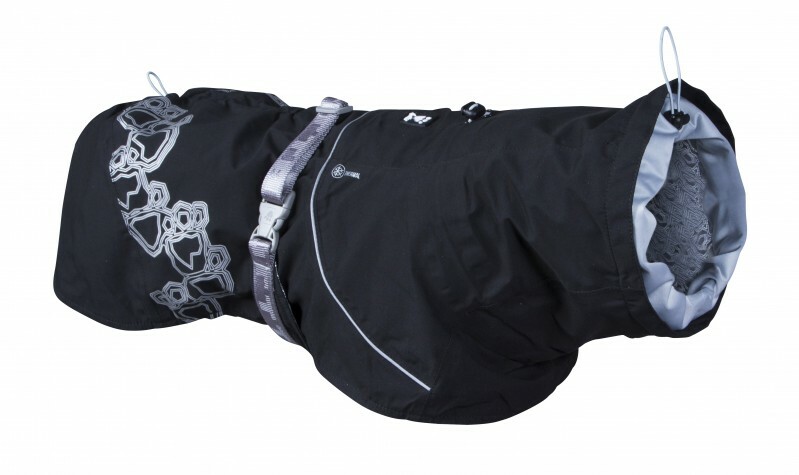 A great new feature on this coat is the heat reflecting foil pattern on the lining known from the Extreme Warmer and Body Warmer helps to keep your dogs muscles warm and protected. Comes in Black and a great new Purple color which has been long awaited by Hurtta fans. Sizes covers all ranges of dogs from the smallest Silky Terrier to the largest Mastiff. To determine which size you need for your dog, please measure the back length from the withers (very base of the neck) to the base of the tail as shown in the video. The back length of the dog is the size you need. Q: Can it be worn with a harness? Thank you. Yes, this Coat has a Leash opening to be used with a Harness underneath. Q: I need a raincoat for my Whippet. Her measurements are neck 15, length 20, chest 23. She is not built like a show Whippet; her back is longer & flatter than most. My concern is how small her neck and girth are compared to the measurements given for the 20 ". Do you think it could work? The Hurtta Drizzle Coat is a great rain coat. I think you may want to go with the 22' coat due to the fact your Whippet is longer than most. You had concerns with your whippets neck being small, the neck has 2 adjustable area's, one at the top of the neck and one near the base of the neck. When you measure your whippets neck, it should be measured at the base of the neck near the body. Please feel free to contact us with any more questions you may have. Q: Am interested in this coat for my fox terrier. He measures 15" on the back and 23" around the chest. Should I order the 14" size? He carries his tail up. I would recommend size 16" for your Fox Terrier and then you can shorten the back length to 15" with the drawstring on the back. Your dog has the same measurements as my German Pinscher and she wears size 16".